On October 21, former uOSFL president Rebecca Richmond, and current Executive Director of National Campus Life Network, appeared on the Michael Coren Show. She appeared along with NCLN President Theresa Gilbert, and Carleton Lifeline’s Ruth Lobo and James Shaw. Jojo Ruba of the Canadian Centre for Bioethical Reform and Alanna Campbell of the Calgary Pro-life club appeared via satellite. 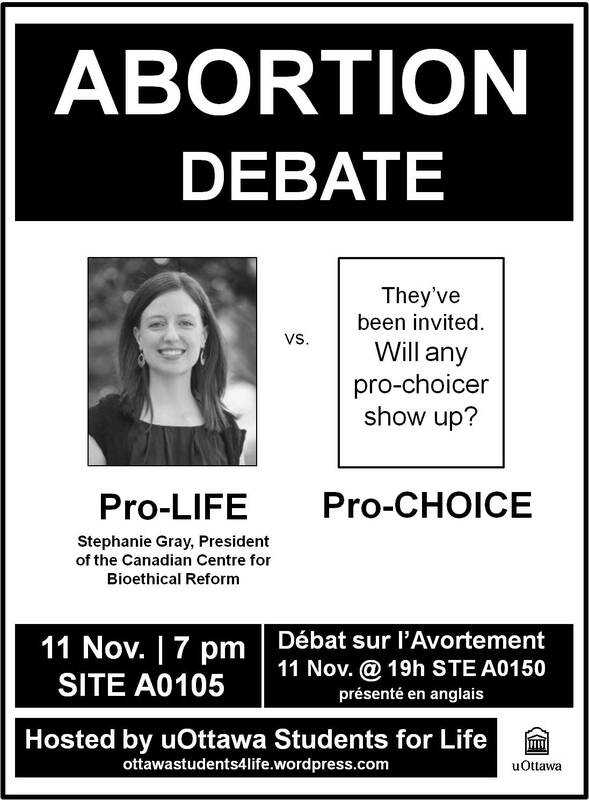 The panel met to discuss the issues of university censorship of the pro-life message, which came to a head in the arrest of 6 pro-life students attempting to display the Genocide Awareness Project at Carleton University earlier this month. In the past three years, 8 university pro-life clubs have met with antagonism from their university administrations over club status or other club rights because of their unpopular and controversial viewpoints. These clubs include UVic, Lakehead, Brandon, and York. Jojo Ruba also highlighted the student protesting he has encountered attempting to deliver his lecture “Echoes of the Holocaust” at St. Mary’s and McGill. uOSFL would like to thank the University of Ottawa for the fair and even-handed treatment they have given us, in that we have neither lost our club status nor our club funding. However, we have received antagonism from pro-choice groups on our campus, most notably the Women’s Resource Centre, which was very antagonistic of our annual baby-shower fundraiser, which supplies maternity and infant clothing and supplies to women in adverse circumstances trying to raise children, through our partnership with First Place Pregnancy Centre. We encourage people to watch the video of the Michael Coren Show and to think about the ramifications of this type of thinking not in terms of the pro-life message, but in terms of freedom of speech and censorship. This entry was posted in for your information, legal issues and tagged Alanna Campbell, Canadian Centre for Bioethical Reform, Carleton Lifeline, James Shaw, Jojo Ruba, Michael Coren, National Campus Life Network, Rebecca Richmond, Ruth Lobo, Theresa Gilbert on October 22, 2010 by uOttawa Students For Life. uOSFL would like to express support for and solidarity with the university students arrested on Carleton University’s campus today in connection with their display of the Genocide Awareness Project (GAP). The students were denied a public space to air the peaceful protest, and were instead offered a closed room in a remote section of campus. This is an issue of censorship of an unpopular message by the Carleton University administration, and a shameful violation of the rules laid out in Carleton’s own student handbook. The students were charged with trespassing. This entry was posted in activism, advocacy, legal issues and tagged Canadian Centre for Bioethical Reform, Carleton Lifelife, Carleton University, GAP, Genocide Awareness Project, James Shaw, legal, Ruth Lobo on October 4, 2010 by uOttawa Students For Life.